A post considering project and challenge based learning and their meaning in the context of technology integration. Writing a post on project and challenge based learning experiences gives me the opportunity to share some thoughts on how important collaborative, self-directed learning is. Another happy little outcome is that, without focusing on the all-important-topic of ICT integration, tech is slathered all over effective implementation of both. All of the discussion about seamless integration has been rendered moot in this context. So, having shared this little insight (though really, a rather important realization for me) we can now turn to the matter at hand; learning that matters, right now, for the students. Challenge-based learning (CBL) is a pedagogic approach for K12 education pioneered by education staff at Apple, Inc. that has its roots in problem-based learning and the work of John Dewey. The approach focuses on increasing student engagement. Unlike problem-based learning, CBL is a collaborative learning experience in which teachers and students work together to learn about compelling issues, propose solutions to real problems, and take action. The approach asks students to reflect on their learning and the impact of their actions, and publish their solutions to a worldwide audience. I can focus on PBL examples in order to further clarify essential elements of both aproaches. Embracing both, or either, however, demands a large shift on the part of the teacher in terms of really believing in the students taking ownership of their own learning. On a personal note, I have found the misconceived perceptions of other teachers to be another stumbling block when implementing PBL in a school unaccustomed to it. Sharing rationale, benefits and demonstrated successes are effective means of addressing this issue. Teachers are wonderful, and there are hundreds of thousands of them who are creative and terrific, but they are operating in a system that is completely out of time. It is a system designed to produce industrial workers. The industrial revolution is over folks. 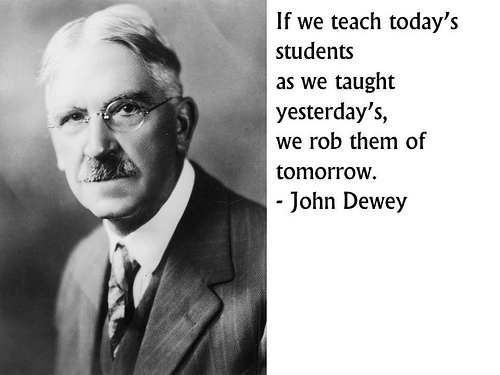 Great post, enjoyed the Dewey quote very much. Great quote you mention by Alvin Toffler as well, about schools being in an outdated system. I often think about this, how things are not taught in ways at schools that are better for not only the teacher but also the students. Unfortunately, I am afraid we all know the answer for this: tradition and the issue of teaching to specific outcomes/outcomes that “must” be covered. Like many businesses that can’t afford to change business models because of a fear of failure, I feel a lot of administrators and teachers feel that same fear when it comes to changing their practices. Regarding CBL, I agree with you in that it feels very similar to the IB’s PYP. For us in the PYP, I feel like that is a good thing as it is another ally, so to speak and it sort of proves the IB’s philosophy is winning over a traditionalist approach to curriculum. Thanks for sharing! Sean – great post. Thanks! What I find interesting is that IB PYP seems well catered for CBL, MYP seems well catered for PBL (which I guess is CBL lite) and the DP seems well catered to neither. It’s like the will to allow students to learn in the most effective manner gets beaten out as they get older. To me, looking from the top down, the only way to change this system is for colleges to change the process in which they decide which students to accept or not. Naturally most schools cater their academic and learning systems to what will give their students the best chance of getting into the college of their choice, be it through APs, IBDPs, SATs or whatever. This invariably results in the problem you describe. That said, it’s all well and good criticising colleges, but I can’t suggest a system that’s any more effective at discriminating between so many students for so few places. The debate for top down change is not new to me. I had a PYP Coordinator who was mad for it. Reading your comments now, however, I was hit with a new realization (because if I said insight I would come across as rather worthy). If we expect colleges/universities to start altering their selection process perhaps we have to look further up the food chain to business. Let’s face it if, as Alvin Toffler suggests, schools were institutionalized in order to produce workers than universities must share much of the same legacy. I see some rolling their eyes but I ask, is it the Arts and Classics departments that are shrinking or the MBA programmes? Aaah… I must admit I WILL miss COETAIL when it ends. People kind enough to read my posts and engage in pedagogical dialogue. Great stuff. Great post. I think it’s really interesting that you aligned CBL with PYP. It seemed to me in our COETAIL meeting that people seemed to think that CBL was better for older kids, because they already have a knowledge base in which to solve problems. But I agree with the inquiry-based learning in PYP is perfect for CBL. And no one is more passionate about making sure the world is fair than a elementary students.